This peaceful Sarasota pad borrows and blends the best from modern design and energy efficiency. 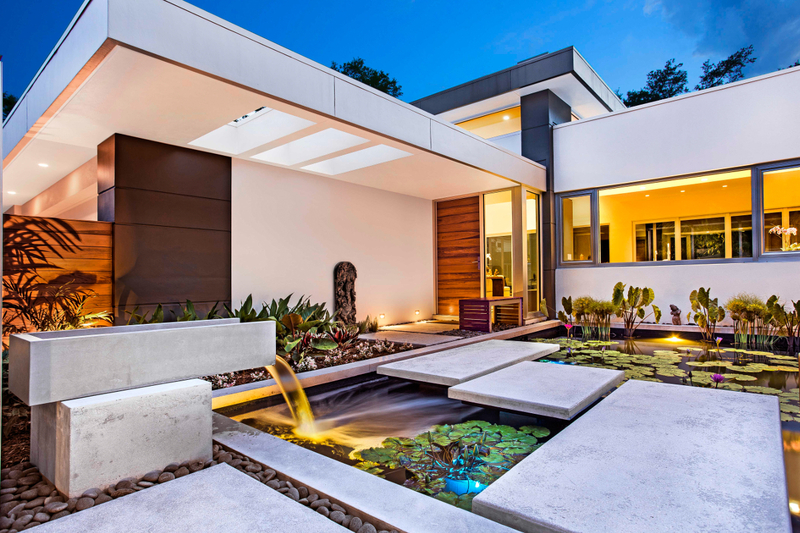 When you enter this house by stepping across concrete pads that appear to float over a lotus pond, you know you are in for a modernist Zen experience. Expanses of clean white walls and polished concrete floors are highlighted only by art and sculptures from Asia and India. This more modern grandchild of that design style stands in Sarasota, Fla., and is infused with California influences, as well as the Sarasota School of Architecture, with its large windows and innovative ventilation systems. Its personality is splashed with some color and warmth from the lotus pond to the Oriental carpets, cypress woods, terrazzo tiles, and bamboo panels, with lots of windows to bring the outdoors in. “The warmth of materials and key pieces give it some quality and color and character,” says Mark van den Broek of Sarasota’s SmartHouse Integration, the home systems design and installation firm that equipped this modern house for modern times. Keeping with the modern theme, the house is green. Boy, is it green. Tightly built and heavily insulated construction by local green builder Josh Wynne gives it net zero status and a negative HERS (Home Energy Rating System) score, which means it produces more energy than it uses, as well as earning the highest in LEED (Leadership in Energy and Environmental Design) Platinum designation. The house is also built to mitigate sound from a busy street. A minimalist and very green design does not leave much room for high-tech home systems, although the owners still wanted some–with a minimalist theme, of course–to control lighting, security, heating and cooling, and audio and video components. And, of course, the technologies could not interfere with the clean and streamlined aesthetic. Instead of a more flashy home control system, the owners opted for a functional and practical HAI (Home Automation Inc.) by Leviton system (Leviton bought HAI in 2012). They use a single HAI 7-inch in-wall OmniTouch panel mounted in an unobtrusive spot near the kitchen and HAI’s Snap-Link app for iPhones and iPads to operate most of the gear, including Leviton’s UPB (Universal Power Bus) lighting system (the residence is illuminated entirely by LED light fixtures), Omni IIe security system, OmniStat thermostats, and HAI’s four-zone HiFi audio system. The two OmniStat thermostats are wall-mounted behind corners to go unnoticed, and the HiFi audio distribution system is designed to fit into a structured wiring panel and deliver 40 watts of audio to Niles 7-inch CM7HD in-ceiling speakers in several listening zones. A single round Niles dual-coil speaker that delivers two-channel stereo sound is wall-mounted in the bedroom, and befits the minimalist mid-century vibe. Audio from a Sonos music system is routed through the HiFi system. It’s a setup that precludes the need to outfit each listening zone with its own streaming component: another score for the minimalist design goal. The system also enables Bluetooth connectivity so that the family can stream tunes from a smartphone or tablet to speakers throughout the house, including those in the lanai, complete with swimming pool and gas firepit. lighting scenes that are choreographed and controlled by the HAI home automation system. “If it’s dark and you walk into the home, a motion sensor will trigger the foyer and kitchen lights to ramp up to welcome you. In the Evening mode, terrace and veranda lighting in the kitchen and dining room, and living room, and lanai come on,” says van den Broek. A motion sensor in the master hall also actuates a program to raise the intensity of the lights to 30 percent for four minutes between midnight and 5 a.m. to create a safe but not blinding pathway for middle-of-the-night trips to the kitchen and bathroom. While the HAI system lends convenience to the control of lighting, van den Broek made sure to provide the homeowners with a quick and easy mode of manual operation, courtesy of simple, basic, unobtrusive rocker switches mounted to the walls throughout the house.